Hello everyone and especially to you: friends hikers. 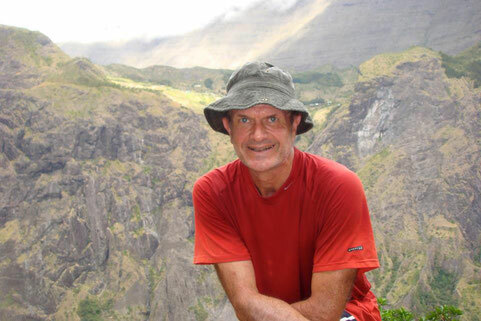 I introduce myself, I am Gilles, a Réunion-man by adoption and Réunion lovers for over 30 years. I discovered this island in 1983 and fell immediately in love with its people and landscapes in particular those of the volcano and circuses. I stayed there until early 1985 before leaving to visit other countries and especially other volcanoes or volcanic sites in the world: Stromboli, Etna, Cotopaxi and Chimborazo in Ecuador Pele, Mountain in Martinique, Les Capadoces Turkey without forgetting the Auvergne volcanoes near my home Dordogne. So for 10 years, I am often back to see my friends Reunion and it was in 1995 that I finally decided to drop off my bags. At first, I practiced many sports including diving (level 3) and canyoning (federal monitor). Now with my accompanist state diploma in the mountains, is guiding you on and off the track that I prefer to share my passion for this extraordinary island.